Update 4/2/14 - If it wasn't clear, this was post an April Fools' Day joke. Thanks for playing along! 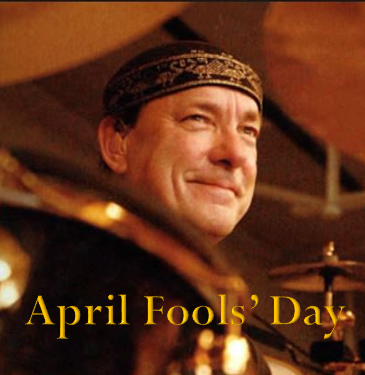 Today, via his website, Neil Peart announced that he's embarking on a 12-city drum solo tour starting on May 6, 2014. "After touring consistently over the past two years," Peart wrote, "I thought I needed to take some time off. But after a few months, I realized I needed to get back to work." Peart credits Terry Bozzio for giving him the idea of taking on a drum solo tour. "Terry Bozzio, who's the 'artist-in-residence' at Drum Channel Studios--where I also practice and rehearse for Rush tours--told me about his North American drum solo tour to celebrate the 50th Anniversary of his first drum lesson. I started thinking this would be a perfect way to get back out on the road." Evidently, Bozzio wasn't thrilled with the idea. "Neil told me he liked my drum solo tour idea so much, he was going to do it, too," Bozzio wrote on his Facebook page. "In fact, he even talked about joining my tour. But even if I wanted to, with all the drums we both have it would probably be next to impossible." One big change for this tour, which will take him across parts of the U.S. and Canada, is that for the first time Peart will be taking his family on the road with him. "Recently, my four-and-a-half-year-old daughter Olivia and her mother joined me at our Quebec home to enjoy the Canadian winter for a week. I was so impressed with how Olivia handled it--sledding, snowshoeing, cross-country skiing, feeding the birds. That was when I realized she was ready for the road." Peart will be traveling with his family on a luxury tour bus for part of the time and exploring other destinations on his motorcycle on days off. "I'll be joined by the West Side Beamer Boyz during different parts of the trip. I realized it wouldn't be a proper tour without them." "I typically solo for three to eight minutes at a Rush show, and doing this for an hour-and-half to two hours is going to be physically and mentally demanding. It occurred to me that it might be equally demanding for an audience, too--especially non-drummers. So, I have a few tricks up my sleeve. Let's just say that it involves my first Slingerland kit, my candy apple red Tama kit, one of my Ludwig kits, and a new DW kit that John Good is building for me just for this tour. With all these drums to set up, I've called on Lorne 'Gump' Wheaton to be my drum tech. But, honestly, three or four drum kits might be too much--even for him. We might have to call in more help." Although there are only 12 dates so far, Peart says there might be more coming soon. "We might expand the number to 21 from the current 12; but that depends on how it goes." See below for official tour dates.